22, of Rochester, N.Y.; assigned to 2nd Assault Amphibian Battalion, 2nd Marine Division, II Marine Expeditionary Force, Camp Lejeune, North Carolina, killed October 15, 2004, by enemy action in Babil province, Iraq. Friends remembered a 22-year-old Marine killed in Iraq last week for his sense of humor. Lance Corporal Brian K. Schramm, of Rochester, New York, died Friday in Iraq’s Babil province, a hotspot south of Baghdad where the U.S. military launched a major offensive this month to try to quell insurgents. He was serving his second tour of duty in the country. The Defense Department did not release details about Schramm’s death, but his father, Keith Schramm, said his son was killed by shrapnel, the Rochester Democrat and Chronicle in New York reported. Schramm, who was assigned to the 2nd Assault Amphibian Battalion, 2nd Marine Division, Second Marine Expeditionary Force, based at Camp Lejeune, North Carolina, was described by friends and family as a decent person with a sense of humor. “He was the most genuine person you’d ever meet in your entire life,” said friend Jon Zodarecky, who graduated high school with Schramm in 2001 and later enlisted in the Army. 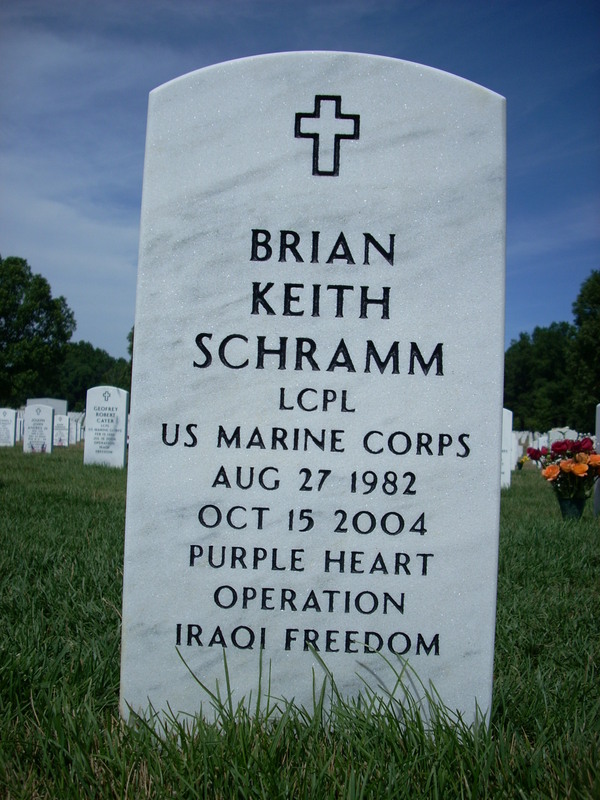 Keith Schramm said his son decided as a youngster that he wanted to become a Marine. “It was a lifelong dream,” he said. Schramm spent five months in the Middle East and Iraq last year during and after the invasion, and was deployed again in June. GREECE, NEW YORK — Lance Corporal Nathan Clarke was granted a highly unusual 10-day leave to attend the funeral of his best friend, Brian Schramm, a fellow Marine killed in combat in Iraq last month. On Thanksgiving Day, Clarke got a call of condolence from President Bush. “He thanked Nathan three times for his service to his country and expressed his very deepest sympathies for the loss of his very good friend,” Clarke’s father, Allan, said Friday. Clarke, 21, was serving with the 8th Tank Battalion in Djibouti in eastern Africa when he learned that Schramm, 22, had been fatally wounded by shrapnel in an attack south of Baghdad on October 15. The pair, who had been friends since kindergarten in the Rochester suburb of Greece, spent a summer together as high school exchange students in Germany. 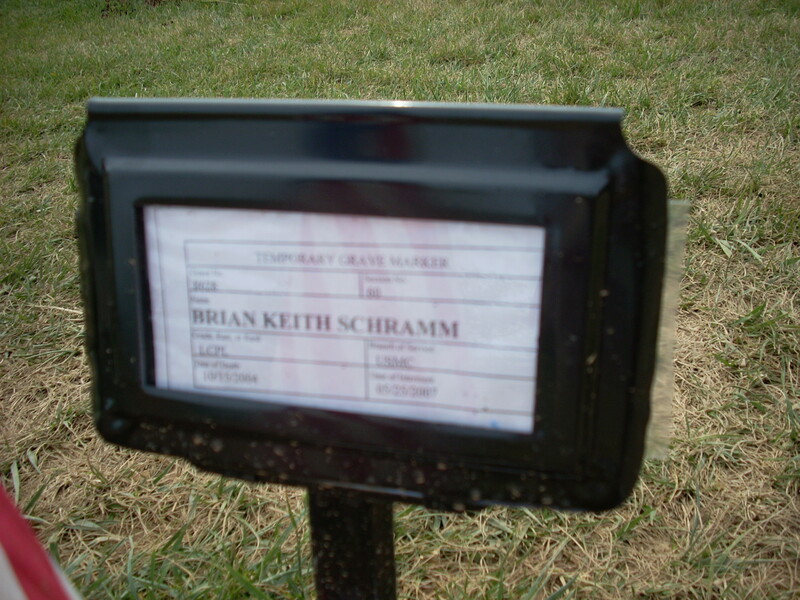 Schramm’s parents asked the Marines to allow three of his friends in the military — Clarke and two others stationed at U.S. bases — to attend the funeral. The Marines normally grant such requests only to immediate family members. Getting the telephone call from the president was humbling but also bittersweet. Clarke, who joined the Marines out of high school, returned to his unit earlier this month and expects to remain on tour until February. On Thursday morning, Bush called 10 members of the military representing all five branches of the service. “As the men and women of America’s armed forces are sacrificing for the liberties we all enjoy, the president wanted to express his gratitude for their service and sacrifice, and to wish them a happy Thanksgiving,” White House spokeswoman Claire Buchan said. Lance Corporal Schramm was assigned to the 2nd Assault Amphibian Battalion, 2nd Marine Division, II Marine Expeditionary Force at Camp Lejeune, N.C. Since he was a youngster, his lifelong dream had been to join the Marines, his family said. He spent five months in the Middle East and Iraq last year during and after the invasion, and was deployed again in June. “He was the most genuine person you’d ever meet in your entire life,” said friend Jon Zodarecky, who graduated from high school with Schramm in 2001 and later enlisted in the Army.